Attachment theory is meant to describe and explain people's enduring patterns of relationships from birth to death. This domain overlaps considerably with that of Interpersonal Theory. Because attachment is thought to have an evolutionary basis, attachment theory is also related to Evolutionary Psychology. 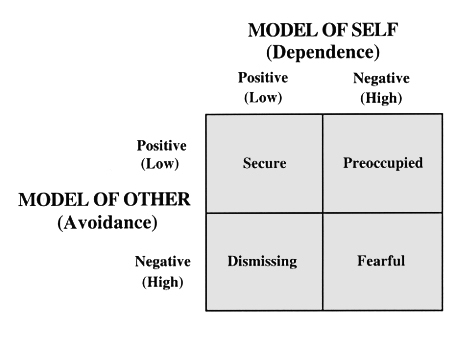 The above model (taken from Bartholomew, 1990) is one representation of attachment styles, or ways of dealing with attachment, separation, and loss in close personal relationships. Attachment was first studied in non-human animals, then in human infants, and later in human adults. Basic research on animal behavior, if it is to apply to humans, must assume that there is homology between the animal and human processes. Homology means that anatomical or behavioral structures in different species share a common function and common underlying mechanisms due to the fact that the species evolved from a common ancestor. Ethological studies on imprinting might appear relevant to human attachment research, since imprinting appears to be a variety of parent-offspring attachment. But as one author says, "The charming tales of geese and cranes that court their keepers (to whom they were imprinted as hatchlings) have beguiled us all" (Klopfer, 1984, p. 157). While imprinting may appear similar to human parent-offspring bonding, imprinting in geese, cranes, ducks, etc. probably does not meet the homology requirement, since birds and mammals both evolved from lizards, and present-day lizards show no evidence of parent-offspring bonding (Crnic, Reite, & Shucard, 1982). Research shows that attachment occurs in dogs and monkeys (Crnic et al., 1982; Gacsi, Topal, Miklosi, Doka, & Csanyi, 2001; Topal, Miklosi, Csanyi, & Doka, 1998). A line of animal research that might be relevant to human attachment is Harlow's experiments showing that infant monkeys prefer a soft terry cloth mother surrogate to a wire one, even when only the wire one dispenses milk. Also, severely deprived infant monkeys often come to behave differently from their normally reared peers (Novak & Harlow, 1975). When a human or non-human primate infant is separated from its parent, the infant goes through a series of three stages of emotional reactions. First is protest, in which the infant cries and refuses to be consoled by others. Second is despair, in which the infant is sad and passive. Third is detachment, in which the infant actively disregards and avoids the parent if the parent returns (Hazan & Shaver, 1987). The fundamental assumption in attachment research on human infants is that sensitive responding by the parent to the infant's needs results in an infant who demonstrates secure attachment, while lack of such sensitive responding results in insecure attachment (Lamb, Thompson, Gardner, Charnov, & Estes, 1984). Theorists have postulated several varieties of insecure attachment. Ainsworth originally proposed two: avoidant, and resistant (also called ambivalent; Ainsworth, Blehar, Waters, & Wall, 1978). This triarchic taxonomy of secure, avoidant, and resistant attachment was developed as a way of classifying infant behavior in the "strange situation." Secure infants either seek proximity or contact or else greet the parent at a distance with a smile or wave. Avoidant infants avoid the parent. Resistant / ambivalent infants either passively or actively show hostility toward the parent. Attachment theory provides not only a framework for understanding emotional reactions in infants, but also a framework for understanding love, loneliness, and grief in adults. Attachment styles in adults are thought to stem directly from the working models (or mental models) of oneself and others that were developed during infancy and childhood. Ainsworth's three-fold taxonomy of attachment styles has been translated into terms of adult romantic relationships as follows (Hazan & Shaver, 1987). Secure adults find it relatively easy to get close to others and are comfortable depending on others and having others depend on them. Secure adults don't often worry about being abandoned or about someone getting too close to them. Anxious / ambivalent adults find that others are reluctant to get as close as they would like. Anxious / ambivalent adults often worry that their partner doesn't really love them or won't want to stay with them. Anxious / ambivalent adults want to merge completely with another person, and this desire sometimes scares people away. Crnic, L. S., Reite, M. L., & Shucard, D. W. (1982). Animal models of human behavior: Their application to the study of attachment. In R. N. Emde & R. J. Harmon (Eds. ), The development of attachment and affiliative systems (pp. 31-42). New York: Plenum. Gacsi, M., Topal, J., Miklosi, A., Doka, A., & Csanyi, V. (2001). Attachment behavior of adult dogs (Canis familiaris) living at rescue centers: Forming new bonds. Journal of Comparative Psychology, 115, 423-431. Klopfer, P. H. (1984). Caveats on the use of evolutionary concepts. The Behavioral and Brain Sciences, 7, 156-157. Lamb, M. E., Thompson, R. A., Gardner, W. P., Charnov, E. L, & Estes, D. (1984). Security of infantile attachment as assessed in the "strange situation": Its study and biological interpretation. The Behavioral and Brain Sciences, 7, 127-171. Novak, M. A., & Harlow, H. F. (1975). Social recovery of monkeys isolated for the first years of life. Developmental Psychology, 11, 453-465. Topal, J., Miklosi, A., Csanyi, V., & Doka, A. (1998). Attachment behavior in dogs (Canis familiaris): A new application of Ainsworth's (1969) Strange Situation Test. Journal of Comparative Psychology, 112, 219-229. "Attachment and Divorce: Family Consequences"
This paper discusses the consequences for spouses and children of attachment separation during divorce. By Cristina E. Eagan. "The Attachment System Throughout the Life Course: Review and Criticisms of Attachment Theory"
This paper discusses recent developments of attachment theory in the area of relationships among peers and criticizes earlier attachment theory. By Erin J. Lee. "Ethological Attachment Theory: A Great Idea in Personality?" This paper presents a critical review and evaluation of the (primarily infant) attachment literature. Despite methodological shortcomings in early attachment research, ethological attachment theory is said to eclipse its nearest rivals. By Patricia Pendry. "Intimate Relationships: Personality Development Through Interaction During Early Life"
This paper presents a stage theory of human development from infancy through early adulthood. By Maren Cardillo. This website links to a number of papers on attachment theory. By Juan Carlos Garelli. Here you can read about imprinting, and design controlled experiments on the phenomenon. By Gary H. McClelland. This website contains much useful material. By Judith Crowell and Everett Bell Waters.